but are balanced to swim level. 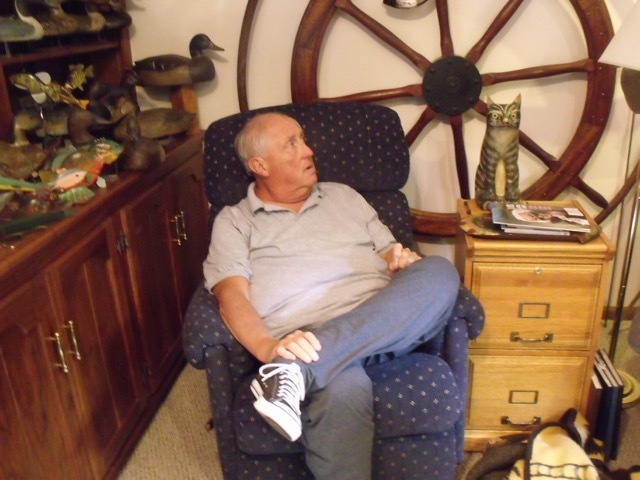 Collector and author of this article, Tom Shumaker. Snow was banked around the base of the shanty to block out the light. Ice around was shoveled clean for several yards to allow natural light to illuminate the water below. 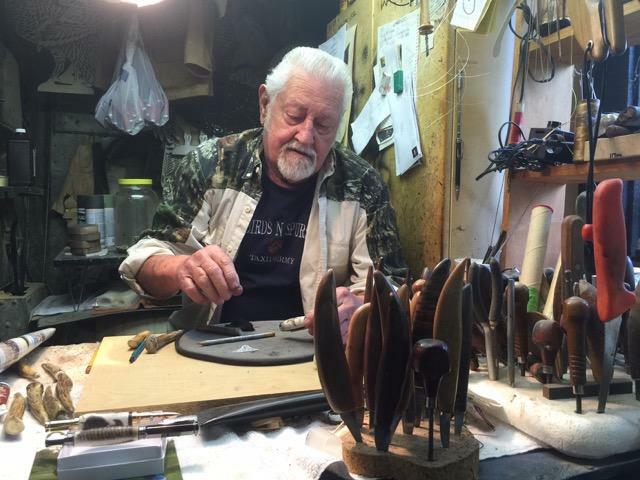 Sonny Bashore, nationally recognized for his decoys, fish decoys, jigging sticks and other forms of wildlife art will be featured in a presentation Saturday, March 11, 2017 at the ODCCA show. This ornate jigging stick was made of bone and decorated with scrimshaw by Sonny Bashore. 2017 Rules, Fish Decoy and Jigging Stick contests. 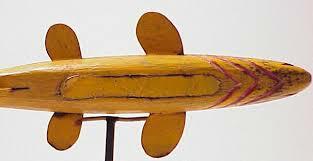 Ice spearing fish decoys are truly one of our American ancestors' first form of folk art. Each was carved for one's individual use and to provide food for the table. Eskimo, American and Canadian cultures are credited with the development of spearing fish decoys, which were often made of bone as were the spear heads. Eventually settlers also picked up on the practice either here or from Scandinavia or Russia. The art was passed on from father to son. When ice spearing began to grow in popularity, so did the use of decoys to attract fish and provide needed food. The usage by both settlers and Indians was in a small area, for cold weather was required, mainly in upper New York, Michigan, Wisconsin and Minnesota, as well as along the Pacific coast and some Canadian lakes. To really appreciate the fish decoy, it is necessary to understand how they were made and used. 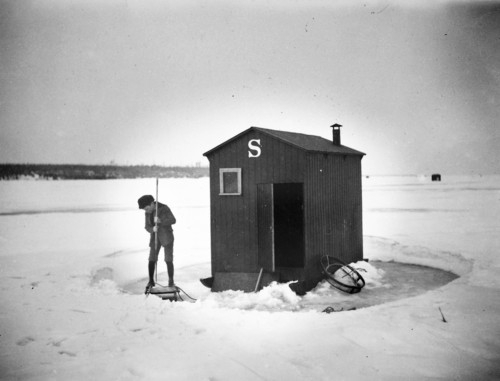 When lakes, bays and rivers are frozen sufficiently to position a “Shanty”, the avid spearers took to the ice. Sticks and blankets or tree-limbs were made into a teepee, or some had wooden huts/shanties. Snow was banked around the base of the structure to block out the light. Ice around was shoveled clean for several yards to allow natural light to illuminate the water below. Navy beans, sliced potatoes, white pebbles, oatmeal or egg shells were designed by the fisherman and dangled into the water. The pole would then be manipulated to swim the fish decoy in circles or figure-eights. The decoys sometimes appear to be wounded. This would attract the predator fish and enable the spearer to get his prize. Spears were weighted to throw at the fish and were a prized possession of the fishermen, too. Fish decoys were carved from old fence posts, barn beams, or whatever miscellaneous wood was available. The fins and sometimes the tails were fashioned from whatever metal cans were available such as tobacco tins, and even leather in some regions. The eyes could be made from old jewelry, thumb tacks, broken glass, stick pins and other tidbits found around the house or garage. Some were carved as primitive replicas of fish and painted garish colors to attract fish through curiosity. Others had intricate detail and subtle coloration to look like what the fish eat. Decoys are weighted, usually with lead, so they sink but are balanced to swim level. Some were “floaters” or designed to swim in the current of frozen rivers. The fins and tails, if metal, are adjustable, so after being attached to a jigging pole, they could be manipulated to float and act like a fish in the water. The decoys come in all sizes and attract large sturgeon to small panfish. Since the 1970s, collecting fish decoys has become very popular and valuable, as well as the spears and jig sticks. They are not often seen in the water anymore, for spearing seasons are limited to just a couple states. They are displayed in homes, offices and museums as true American art forms. *ODCCA Note: While some collectors seek out decoys made by present-day masters, others limit themselves to vintage fish decoys that were actually intended for use in the old days. Neophyte collectors can often be deceived by newly made decoys that have been produced intentionally to deceive. Examining decoys at shows like ours, and talking with the dealers will greatly help give you a "feel for what is right and what is wrong".